This was unexpected. 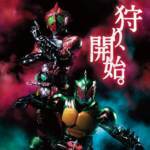 The popular and more adult-oriented Kamen Rider special series, Kamen Rider Amazons, has now seen an official release in the United States via your Amazon Prime subscription. Titled “Amazon Riders“, the entire first season is available to watch RIGHT NOW with English subtitles. Amazon originally announced plans to bring Kamen Rider Amazons, originally available on Amazon Prime in Japan, to English speaking audiences all the way back in 2016 but failed to give any details on release.